A baby monitor offers new parents peace-of-mind by allowing them to monitor their infant from other rooms of the home with ease. It can be very tempting for mothers and fathers to sleep in the room with their child or to carry their baby with them wherever they go. This is actually not helpful for the infant because they never learn to sleep or settle down unless someone is present in the room with them. 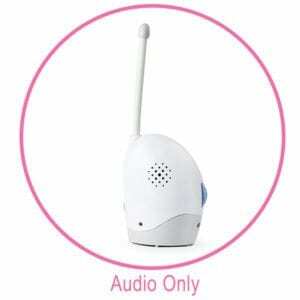 The following are the most common type of baby monitors and work as a type of baby alarm. These simple setups are a transmitter and receiver system able to be used remotely for listening to noises your baby may make. When sound isn’t enough security to ease your mind, these systems may provide you more comfort when walking away from a sleeping baby. Video monitors work similar to audio monitors in the sense that a transmitter device is placed near your baby. However, the difference is that instead of containing only a microphone, this device also contains a camera that allows you to zone in on your infant and display real-time images as they sleep or play in their crib. Some models include a portable screen that can be carried around, while others may need to stay in one place. In addition, some monitors are set up to allow live streaming video options so parents can watch their babies from any computer or device with a secure internet connection. Depending on the model of baby monitor, some additional features that may come with these types of monitors may include LCD display, multiple cameras for placement in different parts of the room, night vision and automatic camera scanning. 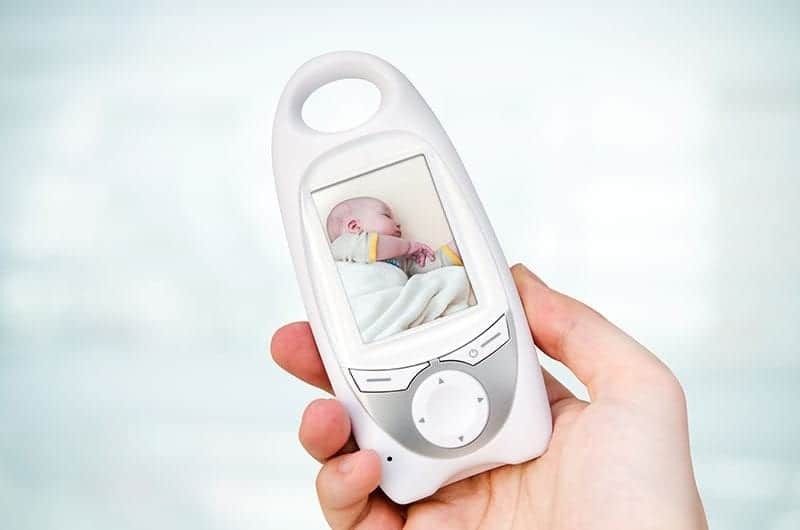 Another option for parents looking to monitor their baby, these baby monitors are typically common for premature babies or those with health complications and can come with sound and video options or as motion-only. These type of motion monitors have a sensor that is placed under the baby’s crib to detect any movement the baby may make. Babies typically move several times during their sleep, thus when no movement is detected for more than 20 seconds an alarm on the receiver will sound. There are as many different types of monitors as there are brands. That’s why it’s important to know which features are ideal so you can determine which monitors are the best value and right for your home. You’ll get the most bang for your buck by doing minimal research on the companies and brands you’re considering. 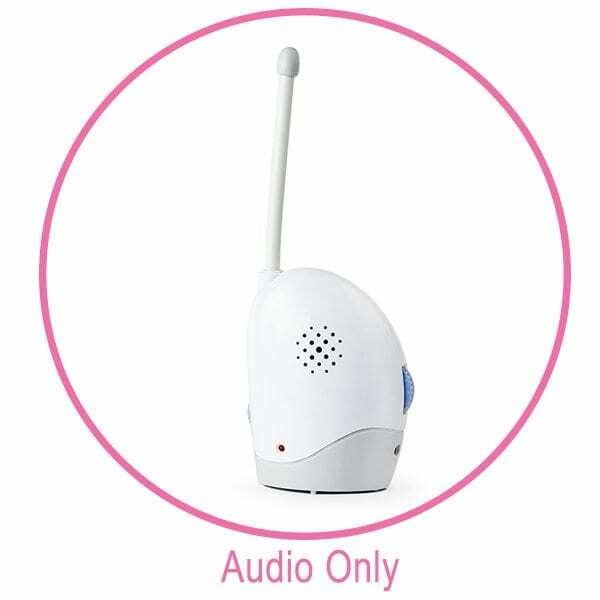 Be sure to check for a unit that allows you to hear your baby from a distance away. Traditional monitors rely on sound to alert you to any issues that your baby may be having. For example, you can hear him or her crying from any room in the home over the monitor. The cons that come with this type of monitor is that there is no way to see the child and its signal may be crossed with other devices on the same frequency. When shopping for monitors, look for a model with a frequency of 900 MHz or higher to reduce possible interference and increase clarity. To increase clarity, Consumer Reports states that Digital Enhanced Cordless Technology (DECT) makes it hard for signals to get crossed and interfere with your baby monitor. If you don’t want the neighbors to hear what is going on in your home or risk the chance that your cordless home phone is broadcast over the monitor, look for a model with a different frequency than the other devices in your home. This is a big selling feature. Ideally, you want to be able to carry the monitor with you wherever you go, especially if you’re the type of parent to rush around trying to get chores and other household obligations done while your child naps. This means that a wireless option is your best bet, and finding a wireless monitor with a belt clip can free up your hands completely. If no belt clip is included, the monitor should have a handle or feel comfortable to cradle in your hand as you walk from one room to another. One thing to consider with portable monitors is battery life. Since baby monitors and handsets are typically always on, try to find a model that can be easily recharged or plugged in for charging as opposed to needing to replace dead batteries every few days. If the room’s temperature gets above 72 degrees Fahrenheit, you’re alerted to the issue instantly. You can adjust the temp in his or her room so that it’s comfortable once again. This is especially important in rooms with several windows as they serve as a natural heat source by allowing sunlight to stream into a room. An additional feature that can be quite handy during certain situations such as when you are vacuuming or watching TV is a sound-activated light. This light feature on the receiver of your monitor will illuminate when noise is detected, giving you a heads up at a single glance in case you don’t hear that little cue from your sleeping baby. It allows you to see your baby even when the room is dark. Some models allow you to turn on a built-in night light to make it less scary for the infant who is trying to sleep. These features are often found on digital monitors. When it comes to shopping for monitors you will see many packages say analog or digital. Analog monitors send signals from the monitor transmitter to the receiver in a straight shot, rather than being encrypted, while digital monitors encode the signal as it travels between the transmitter and the receiver, thus making it much harder for sounds to be intercepted and heard by others outside your home. In addition, digital monitors operate on a frequency that makes signal interference due to radio signals, wireless signals and other devices less likely. When it comes to the cost of a baby monitor, it all comes down to the number of features and the type of technology that is being used. For traditional sound monitors, the cost can be between $15 to $70, while video and sound monitors can run between $50 to $200. For motion-detecting and high-end dual-purpose monitors, costs can range up to $800. Not all monitors are created equal. Since safety is your number one priority when it comes to your child, it should be the one thing that is emphasized by the manufacturer. Keeping your little one safe from harm is the reason why you’re buying the product in the first place. The Dangers of Baby Monitors: Parents Take Note!